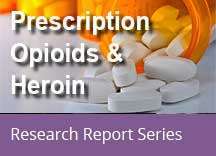 With the increasing use of opioids, there has been a concomitant increase in the number of treatment admissions attributable to prescription opioids and heroin. The number of persons receiving substance use treatment for prescription opioids rose from 360,000 in 2002, representing 10.3 percent of the total treatment population, to 772,000 (18.6 percent) in 2014 (CBHSQ, 2015b). The number of persons receiving treatment for heroin increased from 277,000 in 2002 to 618,000 in 2014 (CBHSQ, 2015b). 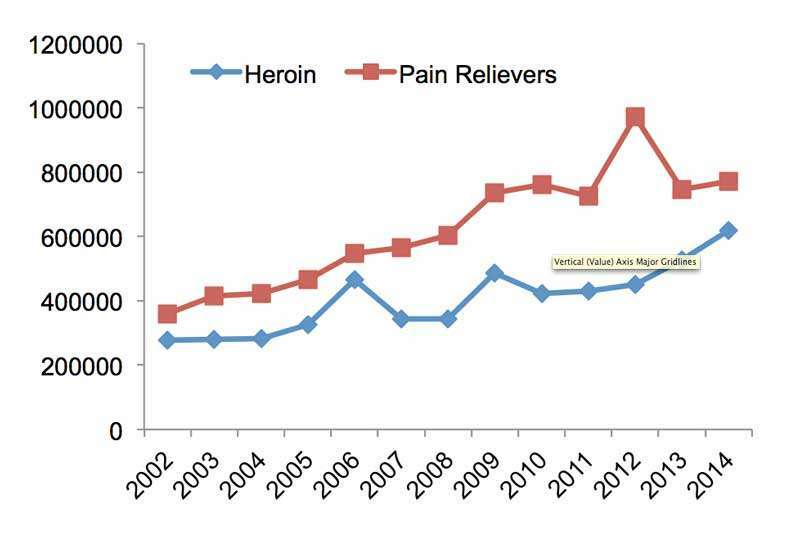 In addition, the number of heroin users in the United States jumped from about 404,000 in 2002 to 914,000 in 2014, and the number of those with heroin "dependence or abuse" more than doubled from 2002 to 2014, increasing from about 214,000 to 586,000 (CBHSQ, 2015a). In addition to efforts to prevent initiation of abuse of prescription opioids and use of heroin, there is a significant need to identify and treat people who have already developed an addiction to these substances. The prescription drug monitoring programs are one means by which states are identifying individuals who are doctor shopping. In addition, there are ongoing efforts to encourage health care practitioners to screen patients for potential drug abuse problems. However, identification is only the first step; it is critical to provide evidence-based treatments for these individuals. Treatment should include access to the opioid use disorder medication options of methadone, buprenorphine, or extended-release naltrexone, which are effective for both prescription opioid and heroin addiction. In fact, a NIDA study found that once treatment is initiated, both a buprenorphine/naloxone combination and an extended release naltrexone formulation are similarly effective in treating opioid use disorder. Because full detoxification is necessary for treatment with naloxone, initiating treatment among active users was difficult, but once detoxification was complete, both medications had similar effectiveness. Currently, far fewer people receive MAT than could potentially benefit from it. 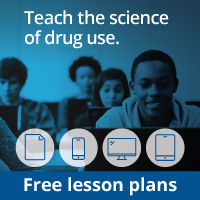 Nearly all U.S. states have higher rates of opioid abuse and dependence than their buprenorphine treatment capacity (Jones et al., 2015), and fewer than 1 million of the 2.5 million Americans who abused or were dependent on opioids in 2012 received MAT (Volkow ND et al., 2014). Removing barriers to MAT access and utilization is a top priority for the U.S. Department of Health and Human Services and is a key objective of the Secretary’s Opioid Initiative to combat opioid drug-related dependence and overdose. Center for Behavioral Health Statistics and Quality (CBHSQ). Table 7.50A. 2014 National Survey on Drug Use and Health: Detailed Tables. Substance Abuse and Mental Health Services Administration, Rockville, MD; 2015. Center for Behavioral Health Statistics and Quality (CBHSQ). Table 7.62A. 2014 National Survey on Drug Use and Health: Detailed Tables. Substance Abuse and Mental Health Services Administration, Rockville, MD; 2015. Jones CM, Campopiano M, Baldwin G, McCance-Katz E. National and state treatment need and capacity for opioid agonist medication-assisted treatment. Am J Public Health. 2015;105(8):e55-e63. Volkow ND, Frieden TR, Hyde PS, and Cha SS. Medication-assisted therapies—tackling the opioid-overdose epidemic. N Engl J Med. 2014;370(22):2063-2066.